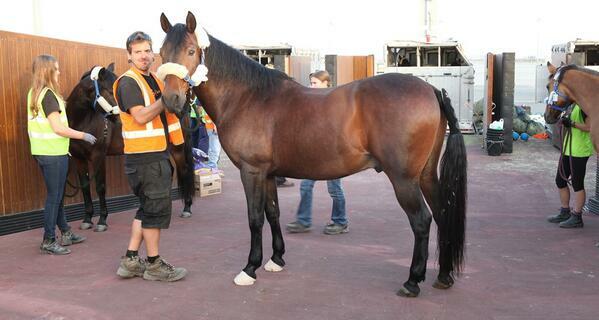 Intradco Cargo Services and operator National Air Cargo have successfully managed a high-profile project to fly 47 horses from Dubai World Central - Al Maktoum International Airport (DWC) as part of the world-famous Cavalia equestrian tour. The charter on a Boeing 747-428(BCF) aircraft was the inaugural flight to make use of the newly-constructed horse loading ramp at DWC - a unique facility designed to allow for the increased import and export of live animal cargo. Livestock and bloodstock transport specialists Intradco - recently acquired by global aircraft charter firm Chapman Freeborn - coordinated the project to fly the horses to Ostend in Belgium following their recent performances in Dubai and Abu Dhabi. Cavalia's productions are a highlight in the live entertainment industry with their one-of-a-kind homage to the age-old bond between human and horse - and the safe transportation and wellbeing of the animals is considered a priority at all times. With the help of National Air Cargo and Equitrans Logistics, the aircraft was configured to accommodate the horse stalls as well as a team of grooms to further ensure the welfare of the horses during the flight. "Animal transportation is a highly specialised business and charters of this nature always require meticulous planning and close coordination with the client and airline.